Get 25 Free Spins every week to use on BetVictor Casinos most rewarding and entertaining games. 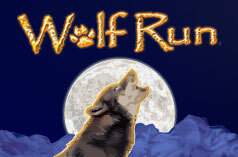 This week’s game of the week is Wolf Run! This week’s game of the week is Wolf Run! All you need to do to receive 25 free spins on this week’s game of the week is to try it out, and wager a minimum of £50 on this slot between Friday the 10th to Thursday the 16th August 2012. So let the power of the wolf lead you to unbelievable fortune in BetVictors exciting new game, Wolf Run. With a pack of fantastic features to take a bite at, you could make a killing on this game. Stacked Wild Symbols can lead some howling big wins, and with a super-rich retriggering Free Spins Bonus, where you can win up to 255 Free Spins, you’ll be howling for pleasure as you land huge wins! Play on Wolf Run this week, and BetVictor will reward you with 25 free spins! Free spins will be credited within 48 working hours after the promotional period ends. Once all the free spins have been used any winnings will automatically be credited to the account in the form of bonus funds. The bonus funds must be wagered a minimum of 30 times before they can be released or withdrawn.